Mexican tarragon is native to Mexico. It is a half-hardy perennial in warmer regions, and can be grown as an annual in temperate regions. 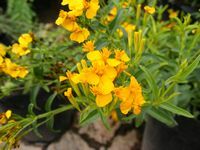 Mexican tarragon can grow up to 70 cm tall, has shiny narrow green leaves and bears clusters of small golden yellow flower heads. It is draught tolerant and needs full sun or partial shade and well-drained soil. Mexican tarragon leaves have a distinct aniseed scent and flavour which is similar to French Tarragon but much stronger. Fresh leaves are used as a tarragon substitute for flavouring soups, sauces etc. Excessive heat causes the leaves to lose flavour, so as with most herbs, add them to hot dishes at the end of cooking. It also makes excellent herb vinegar for use in salad dressings. Fill a 2 litre glass bottle with a large quantity of leaves, cover with wine vinegar and leave for 3 weeks. Strain into glass bottles and add a flowering sprig of Mexican Tarragon for decoration. Chop one or two leaves extremely fine and sprinkle it over a topical fruit salad with a twist of lime and sugar. Mix finely chopped leaves with orange zest and powdered ginger to make a delicious citrusy butter. Add a couple of bruised leaves to a boozy fruit punch. The fresh leaves can flavour drinks - the Aztec people used it in cocoa drinks. Snip fresh sprigs as needed. Before frost, harvest the stems by cutting them at the base. For long term storage Mexican tarragon does best when frozen or stored in vinegar. The Aztec people made a tea with the leaves and flower heads to treat gout, cold, oedema and rheumatism. Up to now no medicinal research have been done with Mexican tarragon. A yellow dye can be obtained from the flowers. The dried plant is burnt as incense and to repel insects.